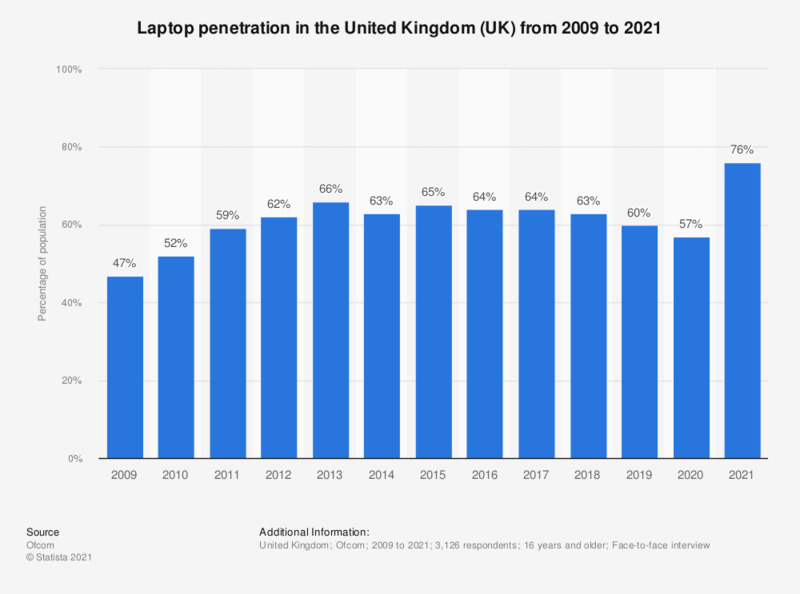 This statistic presents the laptop ownership in households in the United Kingdom (UK) from 2009 to 2018. The penetration of laptops in households increased from 47 percent in 2009 to 63 percent in 2018. Note: Data for 2009-2014 based on Q2 data, all other data based on Q4. During the survey, this question was posed as follows: "Does your household have a PC, laptop, netbook or tablet computer?" Everything On "PC market in the UK" in One Document: Edited and Divided into Handy Chapters. Including Detailed References. Statistics on "Mobile devices in the UK"
Which brand or type of smartphone do you have? How often do you personally use the mobile signal on your tablet computer to go online - rather than using a Wi-Fi connection? How many tablet computers do you have in your household? Which is the most important device you use to connect to the internet, at home or elsewhere? Which one of these devices do you use most for surfing or browsing the internet? Which one of these devices do you use most for social media?